departure a blunder lasting thirteen years. and in front, peach and plum spread wide. and roosters crow from mulberry treetops. My empty home harbors idleness to spare. I’ve returned to occurrence coming of itself. This poem was written around 400 C.E by T’ao Ch’en, the poet who essentially initiated Chinese Poetic tradition. T'ao Ch'ien (365-427) was the first major Chinese poet to speak in a direct personal voice about the full range of his immediate experience. The figure of the poet withdrawing from worldly pursuit ('net of dust', indicating corruption and grime) in favor of spiritual and artistic refinement in natural surroundings became the primary persona of subsequent Chinese poetry. What makes this poem archetypal is that it tells the story of this “first poet” giving up empty pursuit of professional ambition and returning home to the more spiritually fulfilling life of a recluse in mountains. T’ao’s return to his farm became a legendary ideal that virtually all later poets and intellectuals revered, and the deeper reason for this is found in the final words of the poem:”occurrence by itself”. This term (the Chinese term is tzu-jan) has been translated through the lens of Western cultural assumptions as “nature” or “freedom”, which reduces thisto a kind of sweet pastoral poem of romantic escapism. But this is neither escapism nor sentimental pastoralism: it is a poem about returning to a life in which perpetual unfolding of Lao Tzu’s organic cosmology is the very texture of daily existence. The vision of “tzu-jan” recognizes earth to be a boundless generative organism, and this vision gives rise to a very different experience of the world. Rather than the metaphysics of time and space, it knows the world as an all-encompassing present, a constant burgeoning forth that includes everything we think of as past and future. It also allows no fundemental distinction between the subjective and objective realms, for it includes all that we call mental, all that apperas in the mind. 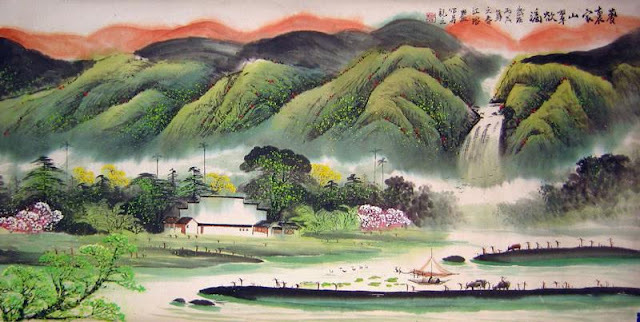 This spiritual ecology of “tzu-jan” was something that was deeply admired by later poets of the Sung Dynasty.